Despite suffering from a crippling genetic disease, pianist Michel Petrucciani had a very successful career until his premature death. He was born Dec. 28, 1962 in Orange, Vaucluse, France. He suffered from the genetic disease osteogenesis imperfecta which causes brittle bones and in Petrucciani's case short stature. He played virtuoso piano despite great pain in his arms. His father Tony plays guitar. So does his brother Philippe and his brother Louis plays bass. His disease caused fractured bones over a hundred times before he reached adolescence. He also had difficulty walking so his dad was usually around to carry him. As a child, Petrucciani saw Duke Ellington on TV and he began to study piano at age four. His other big influence was Bill Evans as Petrucciani started listening to him at age ten. 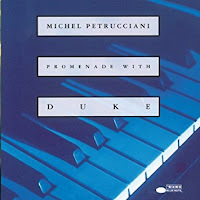 Petrucciani gave his first concert at age 13. He needed to move to Paris to further his career. But his father was very possessive. But musicians intervened and Petrucciani moved to Paris in 1977. He played with Kenny Clarke and then got to play with legendary trumpeter Clark Terry when Terry's pianist didn't show. At first Terry thought it was a gag when someone carried Petrucciani to the piano. But when he heard him play, Terry was astonished and agreed to help him. Petrucciani went to California in 1982 where he convinced sax player Charles Lloyd to come out of retirement and tour with him. Their first appearance was the filming of One Night with Blue Note at Town Hall in New York City. Then they played Montreux and Petrucciani and won the 1982 Prix d'Excellence. Then he moved to New York in 1984 and signed with Blue Note. 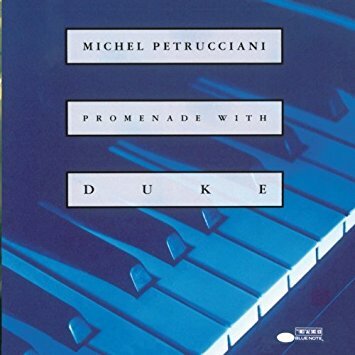 From there Petrucciani was very popular on the jazz festival circuit and he recorded plenty of albums including this 1993 album Promenade With Duke. Of course it's a tribute to Duke Ellington with Petrucciani playing solo piano. This was his final album for Blue Note before switching to Dreyfus Jazz. Petrucciani knew he would die young. So he probably toured way too much especially in the late 90s and he also indulged in alcohol and coacaine. And he was married five times. So clearly he was a tough guy to get along with sometimes. I thought his playing was overdramatic sometimes. Technically he was a great pianist but he didn't have the feel that a guy like Bill Evans had. But audiences clearly loved that. Michel Petrucciani died of heart disease on Jan. 6, 1999 at age 36. Here's Michel Petrucciani performing Satin Doll on the INA TV show Le Cercle de Minuit Mar. 15, 1993.